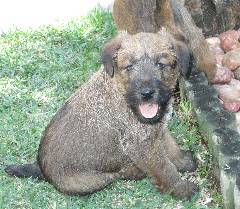 The Irish terrier is an ancient breed, whose history is traced back to Ireland. They were once known as Irish sporting terriers. 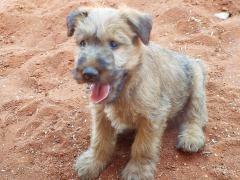 Irish terriers were bred to hunt rats and other animals. They sniffed out and retrieved game. The coat is always red. The harsh wiry coat benefits from being hand-stripped rather than clipped, though the beard and eyebrows can be tidied up with scissors. Brushing the coat to remove dead undercoat will also help. 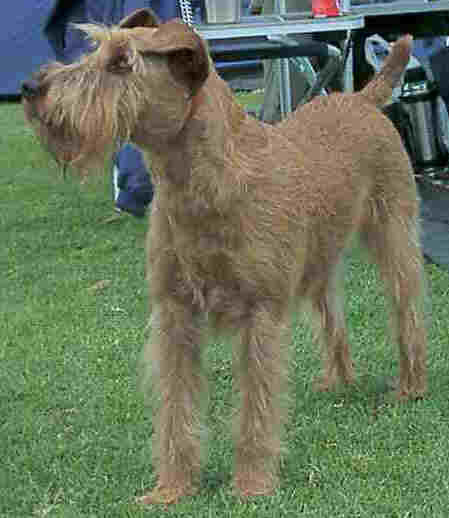 An Irish terrier will often pick a fight with other dogs. They make good guard dogs. The tail used to be docked but docking is going out of fashion. 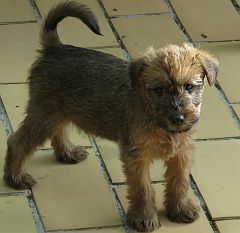 If your Irish terrier gets into a fight with another dog, don't grab his collar, tail, or ears! Your are likely to get bitten. Try squirting the dogs in the face with water & lemon juice. "Like one who grabs a dog by the ears is a passer-by who meddles in a quarrel not his own." Proverbs 26 v 17 The Bible.